ჰენრი ეგარდ უოლესი (ინგლ. 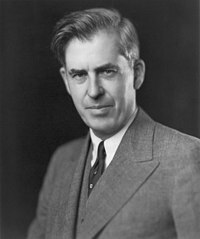 Henry Agard Wallace; დ. 7 ოქტომბერი, 1888 ― გ. 18 ნოემბერი, 1965) — აშშ-ის 33-ე ვიცე-პრეზიდენტი (1941–1945) დემოკრატიული პარტიიდან. http://wgf.org/ The Wallace Global Fund. To promote an informed and engaged citizenry, to fight injustice, and to protect the diversity of nature and the natural systems upon which all life depends. ეს გვერდი ბოლოს დარედაქტირდა: 14:08, 24 სექტემბერი 2018.